On January 9, hundreds of thousands of Catholic devotees in Manila, Philippines, took part in a barefoot procession lasting 22 hours, carrying a centuries-old icon of Jesus Christ through the streets as worshipers climbed over each other to kiss, touch, or rub bits of cloth on the statue. 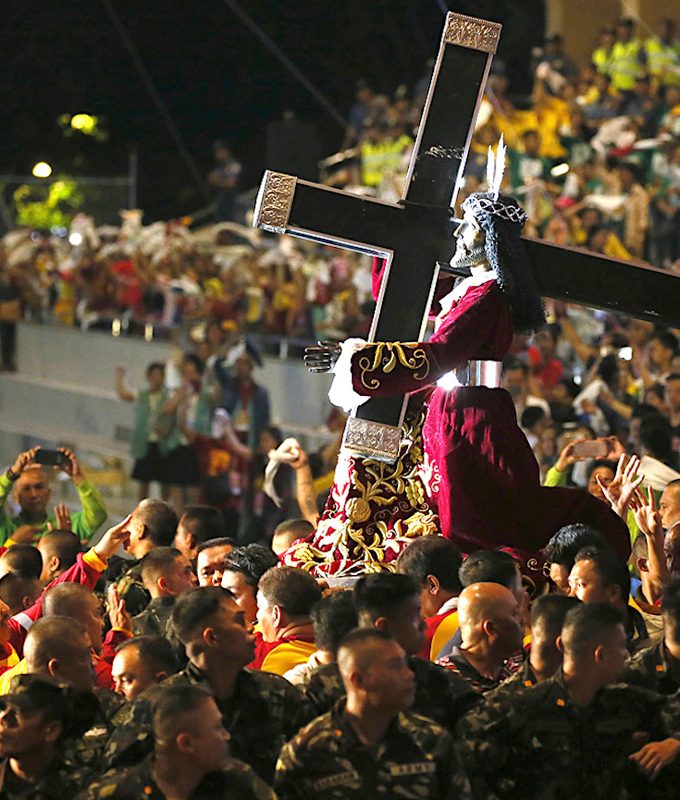 The Black Nazarene is an ebony statue of Jesus Christ brought to the Philippines in 1606, and is believed to have miraculous powers. Organizers said that events related to the annual festival were expected to draw about 15 million people to Manila this year. The Philippines (Listeni/ˈfɪlᵻpiːnz/; Filipino: Pilipinas [ˌpɪlɪˈpinɐs]), officially the Republic of the Philippines (Filipino: Republika ng Pilipinas), is a sovereign island country in Southeast Asia situated in the western Pacific Ocean. It consists of about 7,641 islands that are categorized broadly under three main geographical divisions from north to south: Luzon, Visayas, and Mindanao. The capital city of the Philippines is Manila and the most populous city is Quezon City, both part of Metro Manila. Bounded by the South China Sea on the west, the Philippine Sea on the east and the Celebes Sea on the southwest, the Philippines shares maritime borders with Taiwan to the north, Palau to the east and Malaysia and Indonesia to the south. The Philippines’ location on the Pacific Ring of Fire and close to the equator makes the Philippines prone to earthquakes and typhoons, but also endows it with abundant natural resources and some of the world’s greatest biodiversity. The Philippines has an area of 300,000 square kilometers (115,831 sq mi), and a population of approximately 100 million. It is the eighth-most populated country in Asia and the 12th most populated country in the world. As of 2013, approximately 10 million additional Filipinos lived overseas, comprising one of the world’s largest diasporas. Multiple ethnicities and cultures are found throughout the islands. In prehistoric times, Negritos were some of the archipelago’s earliest inhabitants. They were followed by successive waves of Austronesian peoples. Exchanges with Chinese, Malay, Indian, and Islamic states occurred. Then, various nations were established under the rule of Datus, Rajahs, Sultans or Lakans. The arrival of Ferdinand Magellan in Homonhon, Eastern Samar in 1521 marked the beginning of Hispanic colonization. In 1543, Spanish explorer Ruy López de Villalobos named the archipelago Las Islas Filipinas in honor of Philip II of Spain. With the arrival of Miguel López de Legazpi from Mexico City, in 1565, the first Hispanic settlement in the archipelago was established. The Philippines became part of the Spanish Empire for more than 300 years. This resulted in Roman Catholicism becoming the dominant religion. During this time, Manila became the western hub of the trans-Pacific trade connecting Asia with Acapulco in the Americas using Manila galleons.